The price of Bitcoin is cratering, having dropped nearly 40% in the past month alone. There are no obvious explanations in the news (except that relatively small economy Russia is threatening to ban the cryptocurrency). There are also no obvious slow-moving-planet transits (Pluto is approaching Venus on Bitcoin's first solar return, but when it did this in January we saw little price activity). My best guess is that the culprit is the upcoming lunar eclipse, the effect of which is "leaking" before its peak. I work part-time for company which held its IPO on an eclipse: for the next year the company did very well but the stock price went down or sideways. Eclipses are literally and metaphorically a "blocking of light" and their effects are not easily predictable, perhaps because they obscure our sight. 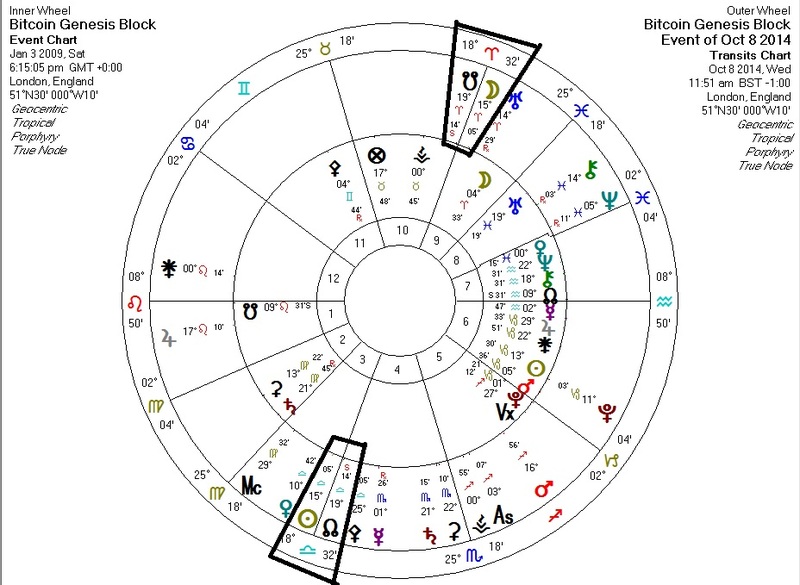 This eclipse happens across Bitcoin's MC axis, squaring the Bitcoin Sun, with the Moon and South Node at the MC, corresponding with a loss in prominence. If the eclipse is the culprit, we could be looking at effects lasting a few months (perhaps subsiding in time for January's Pluto transit against Bitcoin's Sun?). I would see this as a buying opportunity (if you're bullish). It's the three remaining Pluto transits for Bitcoin's Sun that will indicate Bitcoin's long-term fate.